Spoon yogurt into paper towel-lined strainer. Place over bowl and refrigerate 20 minutes to drain and thicken. Combine yogurt, honey, and nutmeg in small bowl. 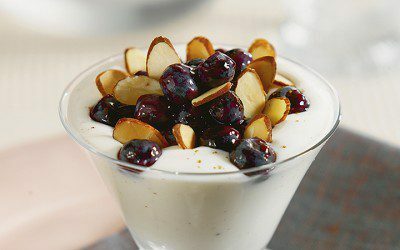 Combine blueberries and preserves; spoon over yogurt. Top with almonds. Exchanges per serving: 2 Fruit, 1 1/2 Milk.